Liberty Head Arts & Found co-owner, Marty Rowe has instilled her love of beauty, color, and the perfect patina on the ideal scrap of wood into her children and grand-children alike. Marty has had several shops and stalls over the years in Norfolk, Va, San Diego, Ca and most recently, Lincolnville, Me, where she’s shared her love for ephemera, lithographed old advertising tins, and other rescued remnants and relics of land and sea. 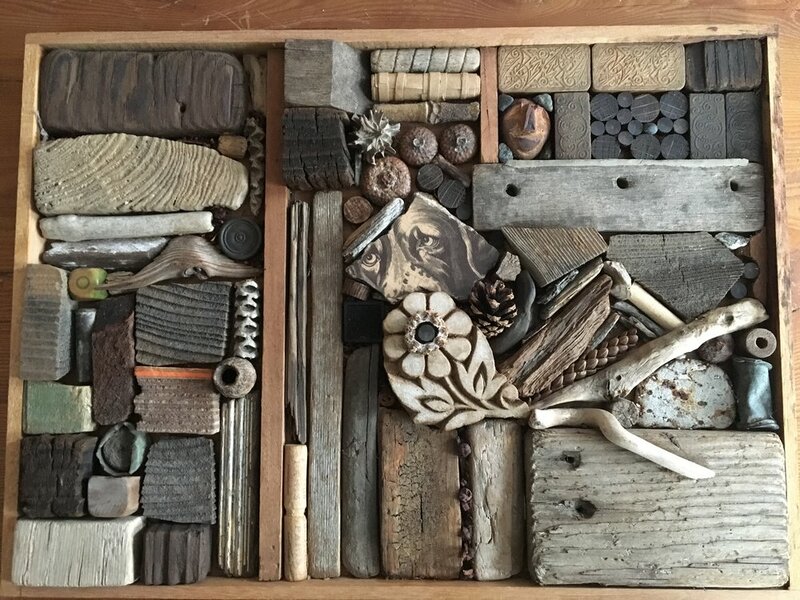 Seldom happier than scouring beaches, salvage yards and flea markets from Paris, France to Searsport, Me., the flotsam and jetsam she adores often ends up in the mixed-media mosaics she's sold-in shops, California farmers’ markets and private commissions.. Though Marty has been a sketcher (and inveterate doodler) since childhood, she's only a sometime Sunday painter. But she’s happily devoted a few winter Sundays to painting our new logo and sign!